Bulgaria covers an area of 11.1 million ha, of which 34% is forest, and 54% is agricultural. From the forests of Bulgaria (total area of 3.5 million ha), only 109,500 ha are managed for conservation of forest genetic resources in reserves and managed reserves, and 104,000 ha are covered by virgin forests. The rest of the country’s forest resources are managed for commercial benefits and as a national treasure, in compliance with the principles of the multifunctional forest use and biodiversity conservation. The ownership of the forests in Bulgaria is divided as follows: 74% state forests, 16% municipality owned and 10% private forests. The management of the forests is under the guidance of the Ministry of Agriculture and Food (MAF), in whose structure the Executive Forest Agency (EFA) acts as a secondary authorizing institution. The management of state forests is carried out by six state forest enterprises covering the whole country. Of the agricultural areas of the country (5.8 million ha altogether) 48-50% are managed as arable, 31% as pasture and 7-8% as fallow. The percentage of perennials is low ~ 4% half the percentage of uncultivated land. Nowadays, apart from illegal logging and forest burning, forestry is also facing a large diversity of problems related to the presence of areas with low forest cover (less than 10% - e. g. those along the Maritsa River) that need to be planted. From agricultural lands 1,7 million ha are eroded, 0,5 million ha are acidic, 0.45 million ha are waterlogged and ~ 0.8 million ha are degraded, saline and polluted. New action therefore needs to be taken on behalf of forest and land owners, in order for the production capacity of the environment to be enhanced. Such opportunities are provided by agroforestry systems. Traditionally, in Bulgarian forestry and agriculture the successful implementation of agro-forestry systems is known both for science and practice. In the past, as well as now, many researchers from the Experimental Station for fast-growing tree species - Svishtov, Forest Research Institute - Bulgarian Academy of Sciences - Sofia, Institute of Mountain Animal Husbandry and Agriculture - Troyan, Institute of wheat and sunflower - General Toshevo, University of Forestry - Sofia, Agricultural University - Plovdiv, etc. have been committed to the research and development of agroforestry systems. Particular success was achieved in the implementation of Agricultural uses of forest plantations (Fig. 6). Agricultural crops are being grown together with tree species either by intercropping, or by being planting in free areas prior to their scheduled afforestation. The ultimate goal of such agroforestry systems is the cultivation of the plantation and its conversion into forest. Along the river Danube were created: poplar with sunflower; poplar with sunflower and cabbage; poplar with corn, cabbage, pepper and eggplant; poplar with melon and gourd; poplar with cauliflower; poplar with wheat; poplar with beans; poplar with tomatoes, cucumber and pepper; poplar with cabbage and okra, and plantations of oak with corn; nut plantations with corn and alder tree plantation with corn. Arable crops and nitrogen-fixing plants have been predominantly used. Apart from the poplars, other tree and shrub species such as willow, acacia, oak, walnut and black walnut, ash, red oak, vernacular, almond etc. and some coniferous e.g. black pine have also been found to be suitable for our weather and environmental conditions. In this way the following was achieved: reduction of the costs of silvicultural management, realization of an additional income, improvement of growing conditions, increased resistance of the plantations to diseases and pests, etc. In the 1950s began the widespread application of the Protective forest belts (Fig. 4) as agroforestry systems. The primary purpose of those forest belts was to reduce the adverse effects of wind, precipitation, water flows and hazardous emissions, and to improve the soil, air and ecological conditions of the surrounding lands and territories. Protective forest belts have been established with main species (oak, gleditsia, walnut, plane (Platanus), cedar, etc. ), associated secondary species (maple, vernacular, wild pear, etc.) and shrubs (hawthorn, sumac, elderberry, etc.). By the creation of protective forest belts, environmental benefits were achieved: the wind-proof effect (reduction of wind speed by 30-40%); reduction of soil evaporation by up to 40%; increasing relative humidity to 16%; reduction in daily temperature amplitudes up to 3°C in the ground layer of air; increasing the duration of snow-retention; providing refuges for birds, wild and domestic animals; and general improvement of forest cover, climate and the landscape. Additional economic benefits were achieved: increase of crop yields by up to 30%; and an increase of soil moisture up to 10% and an overall improvement of soil fertility; crop protection from insect pests by suitable birds colonized the forest belts. Furthermore, the protective belts were made as Shelterbelts in rows (Fig. 1) by planting appropriate tree species (poplar, acacia, willow, vernacular, sycamore, etc.) along ravines, canals, rivers, reservoirs, roads, fields and meadows. The ordinary afforestation in rows provides almost all the ecosystem services that forests and protective forest belts provide, but additional revenues from woody raw materials were also achieved. In the country, on widespread areas, were also created Forest-grassland complexes, in which tree and shrub plant species were mixed with forage crops ("grass mixtures", etc.). These areas are used for freely grazing animals. In this way, ecological farming was developed and a balance of nutrition was achieved on the farm. Wood production can also achieve economic efficiency as well as environmental and social benefits. Recently, in relation to the energy crisis, increasing fuel prices and climate change abatement, strong emphasis has been placed on the building of Specialized forest plantation complexes of tree species for biomass production, despite the financial difficulties. These plantations are established to produce biofuels (ethanol, methanol, biodiesel, gasohol); for renewable energy sources of direct combustion; for pellets, briquettes, steam; for pulp and cellulose materials; for wood-fiber particles in building materials; for feed production (fodder, brown juices, yeast); for the production of organic substrates, composts or fertilizers etc. Along with all the environmental and social benefits from these plantations, opportunities arise for using abandoned areas, achieving good income and covering the energy needs of the agricultural farm itself. The Forest farming is also being developed as an agroforestry system, in which the reconciliation of the naturally and artificially created trees and bushes, and the business activities is being established for a longer period of time. Other products for human consumption and industrial processing, apart from the wood, are also obtained from forest farming. Farms are used for the production of edible mushrooms, medicinal plants, fruits (strawberries, raspberries, blackberries, apples, pear, aronia, etc.) bee and oil-bearing crops, ornamental plants and trees and more. These structures are particularly suitable for the areas protected by Natura 2000 (The European network for biodiversity protection), as long as the environmentally friendly management is maintained. The establishment of agroforestry systems to increase the income of small farmers and foresters in the country, while achieving environmental and societal benefits, could be a good opportunity to boost the economic development of the areas. The ecological-climatic conditions of the country are particularly suitable for the development of forest farming and other forms of agroforestry. The High Value Tree production of high value timber and nuts is very poorly developed in the country. There is a growing interest in walnut, cherry and chestnut production. Different ways for integration of specialized plantations of tree species on farmlands could also be investigated. There is a lack, in the mountainous areas, of well-established Natural and Cultural Value Agroforestry Systems with well maintained grazing woodland and semi-opened pastures. The construction of forest farms is also in the early stages of its development. The organic production of bio-agricultural and forest products as a system for strengthening ecosystems through applying basic agronomic, biological and mechanical methods also have the potential to be developed in the country. The cultivation of bio-products from perennial crops, essential oil production plants, wild growing forest products and herbs is an important development. It is a necessary for the native tree species to be maintained as sources of food, shelter, seeds for birds, especially within Natura 2000 protective zones. Detailed plans for governance have been created for these particular zones. Moreover in the EU, Bulgaria has the highest percentage of protected zones within the Natura 2000 network for biodiversity protection, after Slovenia (34%). In 2011 regimes were developed for the sustainable management of forests within Natura 2000 zones in Bulgaria. The protection of habitats through agroforestry activities (pollarding, hay harvesting, mowing, etc.) can also support the development of populations of protected species. The establishment of riparian agroforestry systems for protection against floods and landslides is necessary as well. 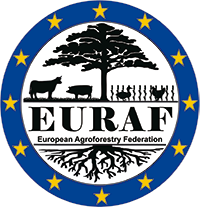 Legislation related to the development of agroforestry in Bulgaria is consistent with those of the other EU member states. The matter is regulated by the following laws: Law on Ownership and Use of Agricultural Land; Law of Forest; Law for Sustainable Land management; Law for Helping of Farmers, etc. It is also expected that the new National Action Programme for Sustainable Land Management (2014 - 2020) will soon come in to action. In accordance with the European policies it relies on the harmonization of business activities with environmental protection as a means for achieving sustainable management. The new Program for Rural development (2014 - 2020) that will be launched soon, is also expected to provide part of the funds. Finding the appropriate financial mechanisms to support agricultural management and forestry is the main challenge. Dr. Kachova, Doichinova Vania, Forest Research Institute, Bulgarian Academy of Sciences, Bulvd “Kliment Ohridski”132, 1756 Sofia, Bulgaria, vania_kachova [at] abv [dot] bg (vania_kachova [at] abv [dot] bg). Sincere thanks to Dr. Matthew Upson, Research Fellow in the School of Energy, Environment, and Agrifood at Cranfield University, UK, and member of EURAF. The text uses photos (see below) and materials from the following book: Agroforestry, Yakimov M., Siptsov V., Kalmukov K., Aleksandrova E., Ionovska I., Eds. By Bulgarian Sweiss Forest Fondation and Silvica Fondation, Svishtov, 2003, 22 pp (in Bulgarian).